Partitioned Primary Index (PPI) is an indexing mechanism in Teradata Database. PPI is used to improve performance for large tables when you submit queries that specify a range constraint. PPI allows you to reduce the number of rows to be processed by using partition elimination. Lets take Order_Table, where we have both January and February dates in column Order_Date. 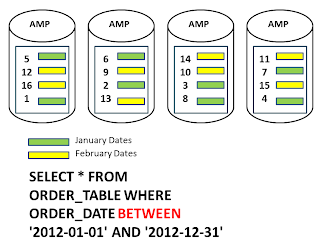 The Order_Table spread across the AMPs.Notice that January and February dates are mixed on every AMP in what is a random order. This is because the Primary Index is Order_Number. When we apply Range Query, that means it uses the keyword BETWEEN. 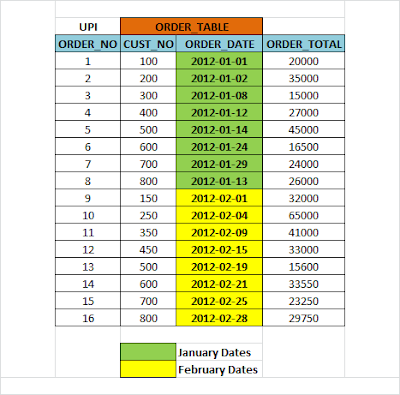 The BETWEEN keyword in Teradata means find everything in the range BETWEEN this date and this other date. 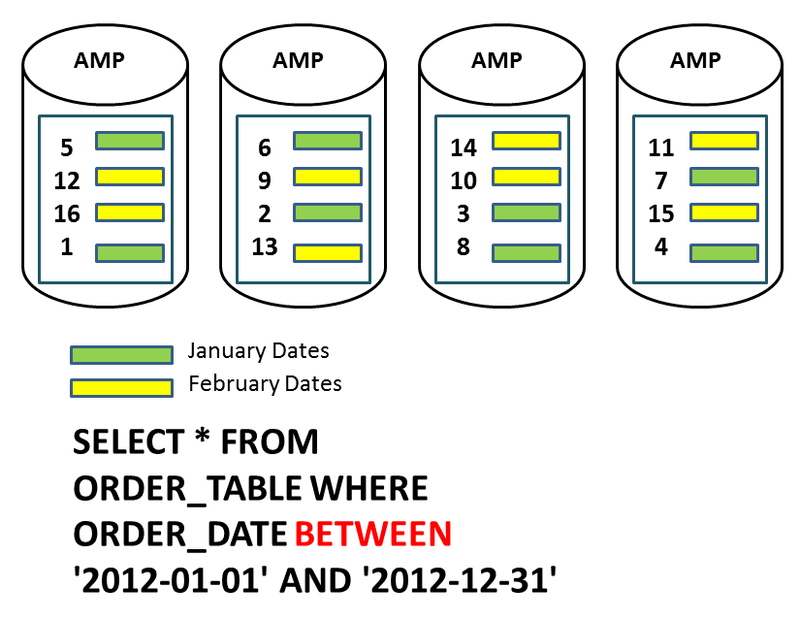 We had no indexes on Order_Date so it is obvious the PE will command the AMPs to do a Full Table Scan. To avoid full table scan, we will Partition the table. The example of AMPs on the top of the page. This table is not partitioned. The example of AMPs on the bottom of the page. This table is partitioned. Each AMP always sorts its rows by the Row-ID in order to do a Binary Search on Primary Index queries. Notice that the rows on an AMP don‘t change AMPs because the table is partitioned. 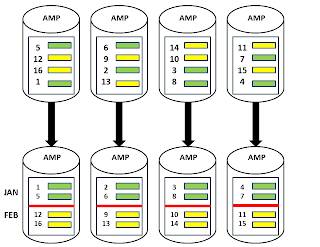 Remember it is the Primary Index alone that will determine which AMP gets a row. If the table is partitioned then the AMP will sort its rows by the partition. Now we are running our Range Query on our Partitioned Table,each AMP only reads from one partition. The Parsing Engine will not to do full table scan. It instructs the AMPs to each read from their January Partition. You Partition a Table when you CREATE the Table. A Partitioned Table is designed to eliminate a Full Table Scan, especially on Range Queries. Below is the example for RANGE_N Partition by day. The UNKNOWN Partition is for an Order_Total with a NULL value. The NO CASE Partition is for partitions that did not meet the CASE criteria. For example, if an Order_Total is greater than 20,000 it wouldn‘t fall into any of the partitions so it goes to the NO CASE partition. You can have up to 15 levels of partitions within partitions. There are four new data types available for Character Based PPI. They are CHAR, VARCHAR, GRAPHIC, and VARGRAPHIC. Ex-Query: Find all Products between Apples and Grapes? A table can have up to 65,535 Partitions. Partitioning never determines which AMP gets row. 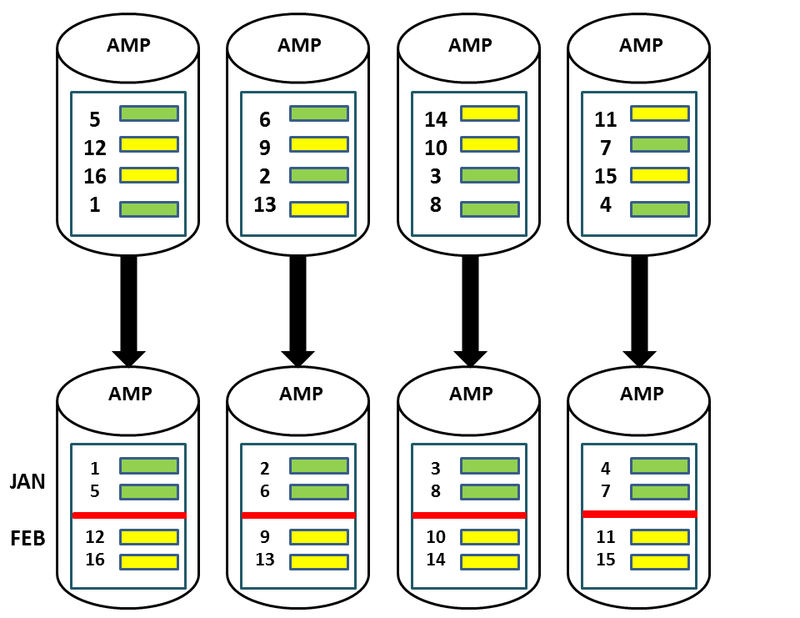 Partitioning determines how an AMP will sort the row on its own. Table can have up to 15 levels of partitions. A table cannot have an UPI as the Primary Index if the Partition table does not include PI. Total 3 forms of Partitioning Simple, RANGE and CASE. They provide efficient searches by using partition elimination at the various levels or combination of levels. Row hash locks are used for SELECT with equality conditions on the PI columns. Partitioned tables allow for fast deletes of data in a partition. They allow for range queries without having to use a secondary index. Specific partitions maybe archived or deleted. May be created on Volatile tables; global temp tables, base tables, and non-compressed join indexes. May replace a Value Ordered NUSI for access. •Rows in a partitioned table are 2 bytes longer. •Access via the Primary Index may take longer. •Full table joins to a NPPI table with the same PI may take longer. PARTITIONED BY (ORDER _DATE).. then can it be UNIQUE PRIMARY INDEX? The index which is defined with key word UNIQUE can only be else it cannot. Hi Admin, Thanks for sharing your knowledge.